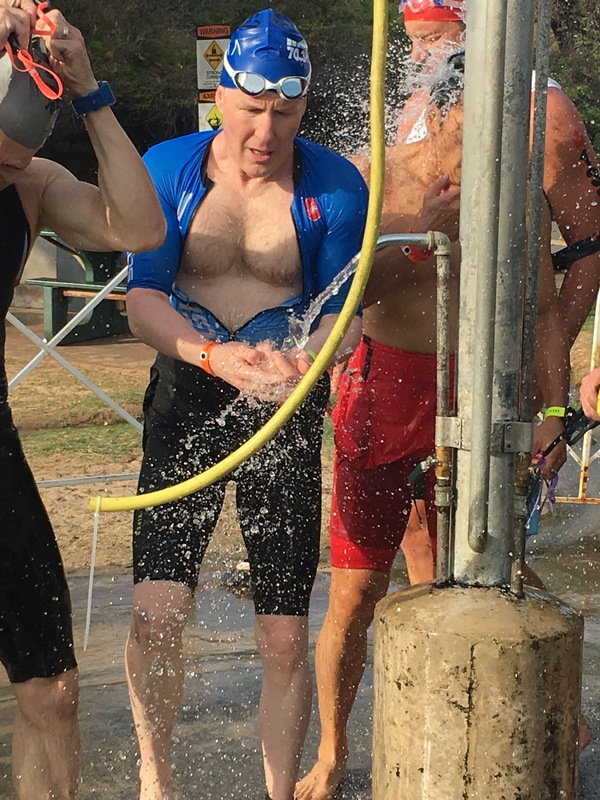 This is me at the Morgan Hill Sprint Triathlon, 13 days before my first half Ironman of the season, the Ironman 70.3 Hawaii – more commonly known as “Honu” (the Hawaiian word for sea turtle). I’d gone down twice during the bike leg, scraping the same side of my body both times but fortunately not breaking anything except a few bike components. The worst part was definitely the first shower later on in the day. After that, I wrapped myself in Tegaderm (and had some help doing the shoulder and upper back, which I couldn’t reach myself) and waited. Every day got better, and in about a week I was able to swim again. Riding and running had continued, though the riding was pretty much all indoors for that first week. Going into Honu, my chief concern was sun protection – you want to avoid direct sun exposure on the wounds if you care about scarring. 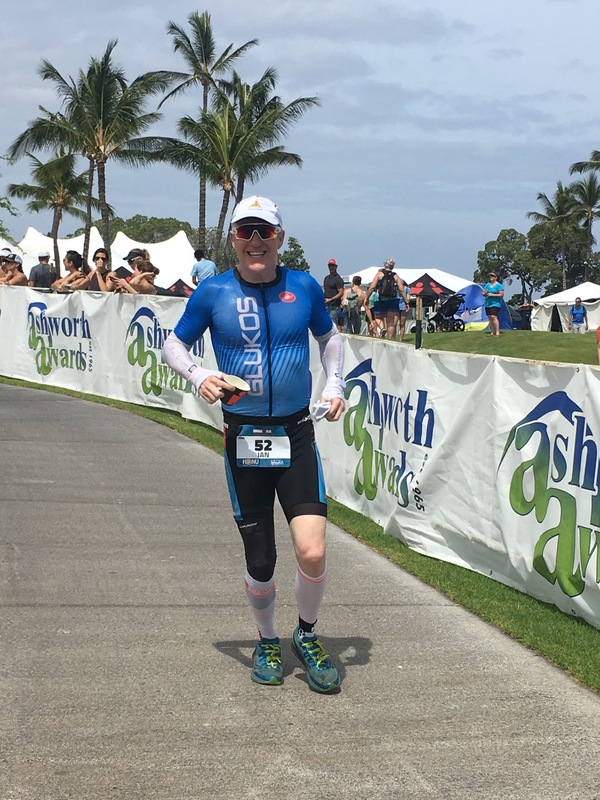 Although my modeling days are pretty much behind me, I took the advice to heart and made my race-day wardrobe choices: short-sleeved tri top, white arm coolers, a thin knee warmer on my right knee, and white compression socks, all of which would be put on in T1. I was definitely not going to win any “fastest transition” prizes. I was, however, eager to see how my swim went. 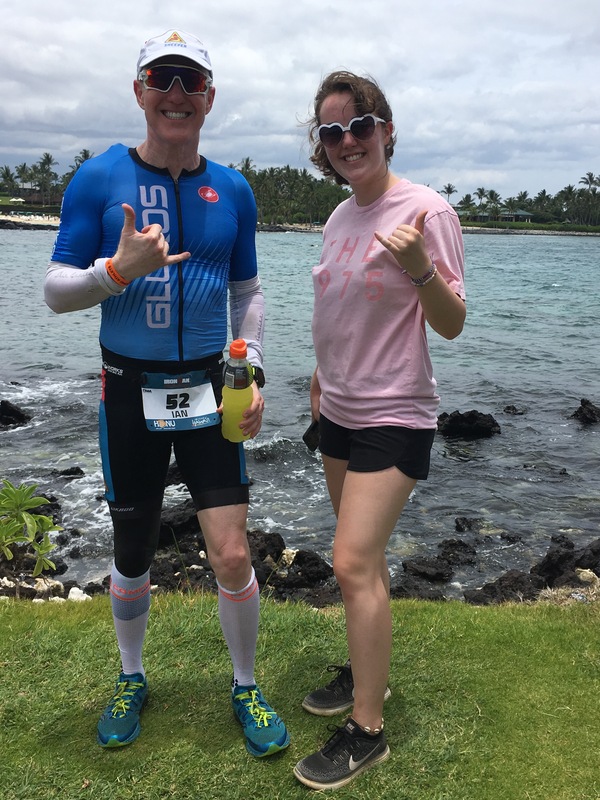 I’d visited Karlyn Pipes and her Endless Pool on my final day in Kona for Epic 5, and she had had me make a number of modifications to my swim stroke. I’d been finding myself swimming well in masters sessions in the pool, basically going as fast without gear as I had before with the Roka sim shorts (aka “cheater pants”), but I didn’t know how that would translate to open water. The Honu swim changed format once again this year, taking last year’s age group waves and adding a rolling start within the waves, in which four swimmers went every few seconds. The other change was the direction – clockwise instead of counter-clockwise. I don’t know how much these changes affected things, but I ended up having my second-best swim here ever (out of nine times) in 36:30, which is 4-5 minutes slower than I swim in calmer water with a wetsuit, but I’m still happy with it. 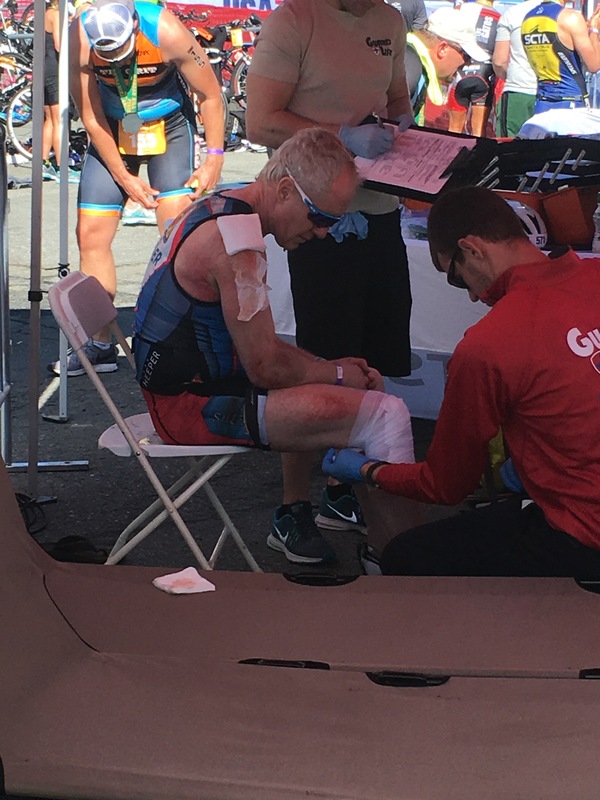 The transition from swim to bike took a while, as I was putting on arm coolers, a knee cover and compression socks in addition to my normal helmet, glasses and shoes. This added an extra 3-4 minutes of time over the normal process but avoided sunburn and additional scarring of the residual wounds from 13 days earlier. The amount of Zone 3 riding is actually higher in 2017, which is mainly because I pushed more into Zone 4 last year. The Normalized Power this year was 7 watts lower, which by itself wouldn’t account for 11 minutes of time, so I’ll attribute most of that to more difficult wind conditions this year. I was also consciously holding back a little more on the bike, hoping it would have a positive effect on my run. Even so, I started getting leg cramps in the final 10 miles of the bike, which didn’t bode well for having a good run. The bike split was 2:40; I’d certainly expected a few minutes better. Remember – this is supposed to be fun! 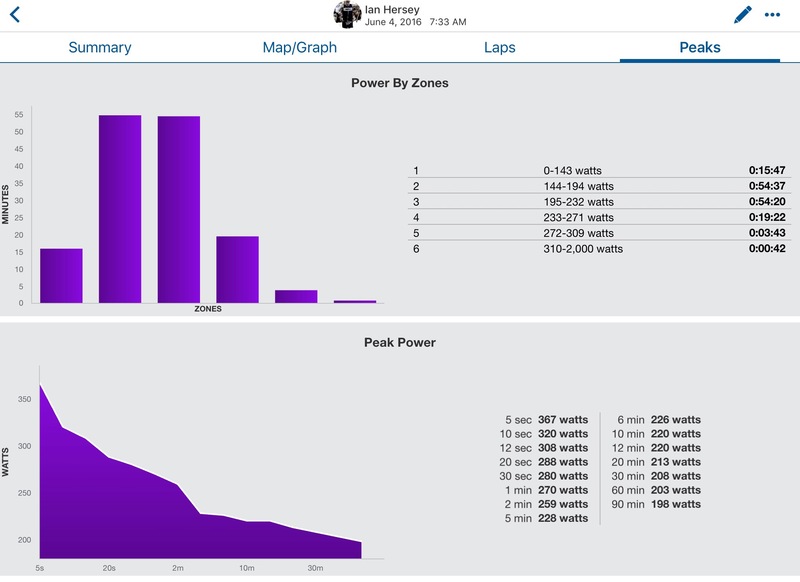 T2 was a bit pokey as well – I wasn’t feeling that great. Still, my wife Jeanne and niece Tana – my support crew – were there, so one needs to be positive and smile for the camera. 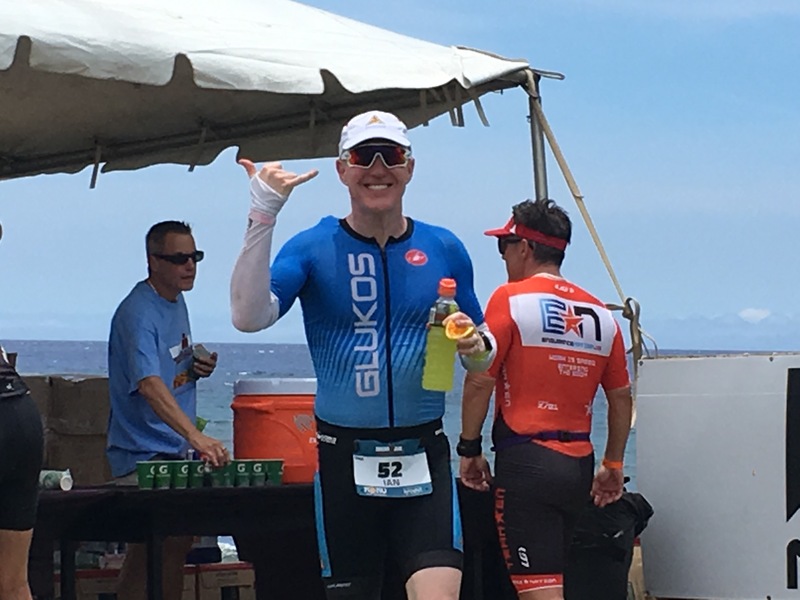 🙂 Initially my running legs didn’t feel that bad once I headed out on the course, so I was optimistic that the run wouldn’t be the crampfest I’ve often experienced in this race. The pace got very ugly in the middle of the race – obviously there I did a ton of walking. But my heart rate also dropped during that section, which allowed my body the opportunity to absorb more of what I was taking in at the aid stations. 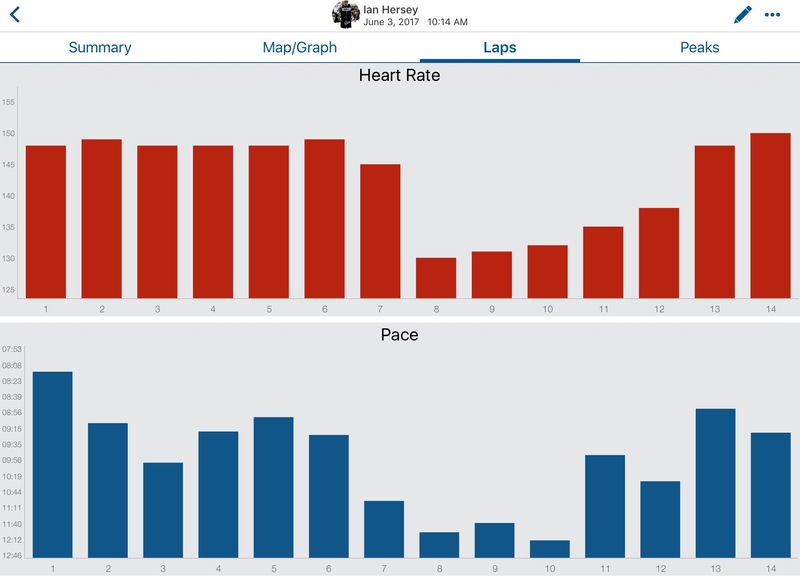 The effect of that, which the graph illustrates, is that mile 13 ended up being my second-fastest mile, and I definitely felt like I was coming good again. 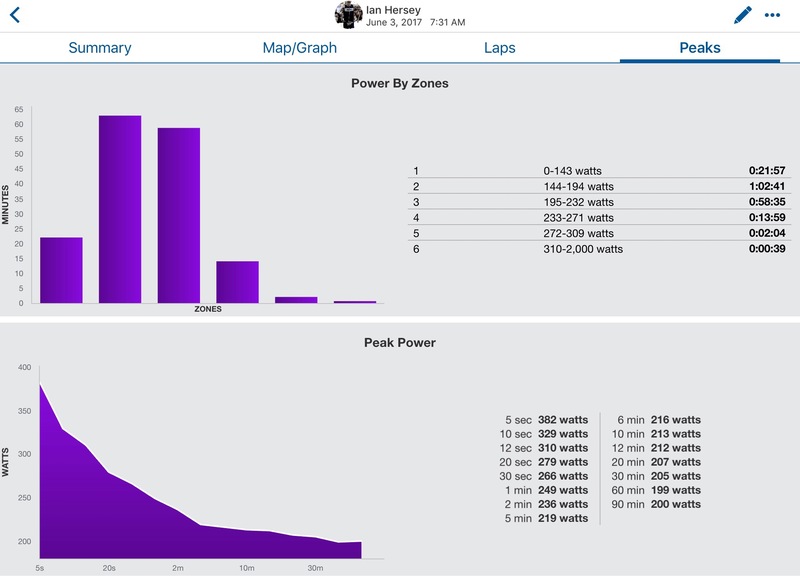 The lesson from this is that I need to do a much better job of taking nutrition in during the bike segment in order to avoid these kinds of lows during the run. 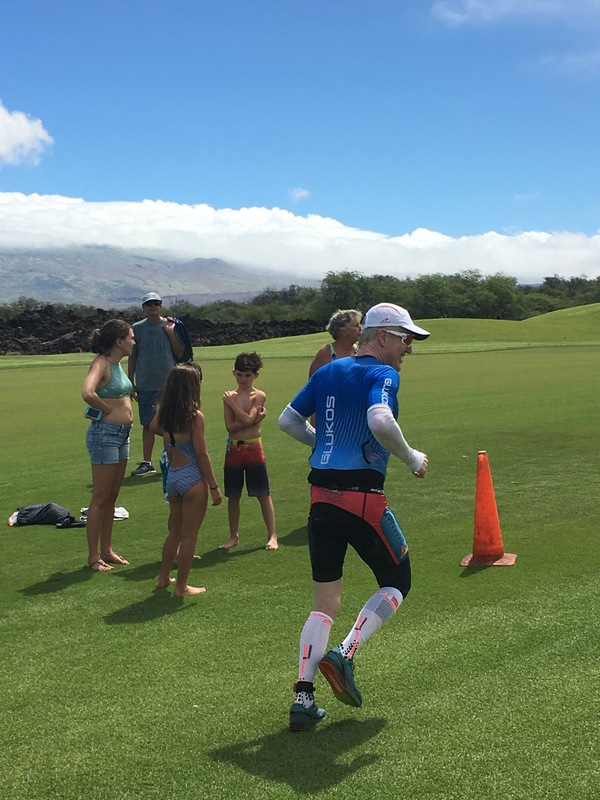 If you come into the run depleted, you can’t take enough in and have your body actually make effective use of it unless you slow way down and drop your heart rate – this seems to be especially true in hot, humid conditions. 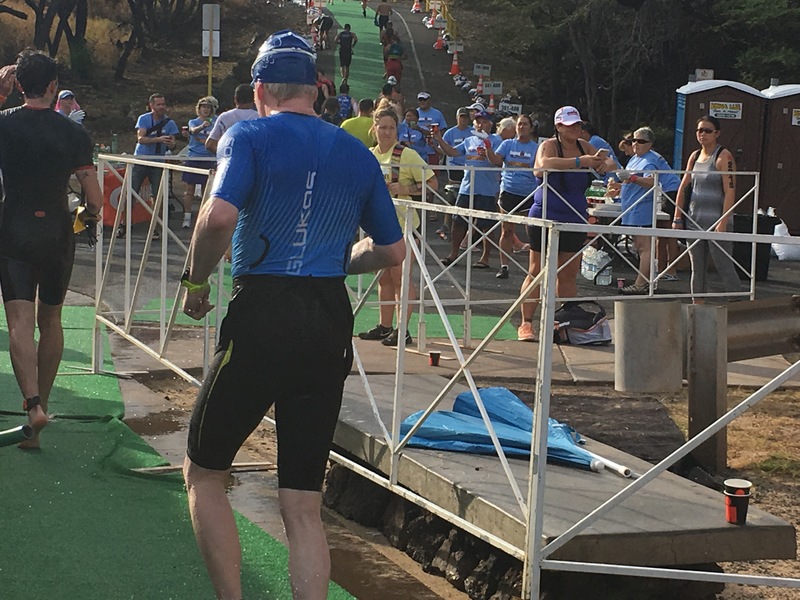 In races on the Mainland I don’t typically see the mid-run crash like I do in the Honu race, even in fairly hot (but not humid) venues such as the Vineman race. With my niece Tana, half of my awesome support crew. All photos courtesy of Jeanne Cooper unless otherwise noted. Next up? Not sure yet. 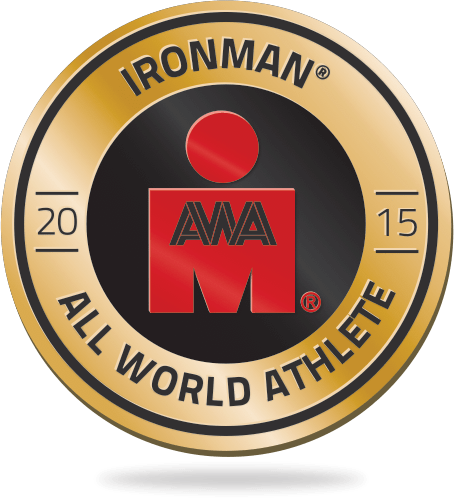 A full Ironman might be on the horizon. 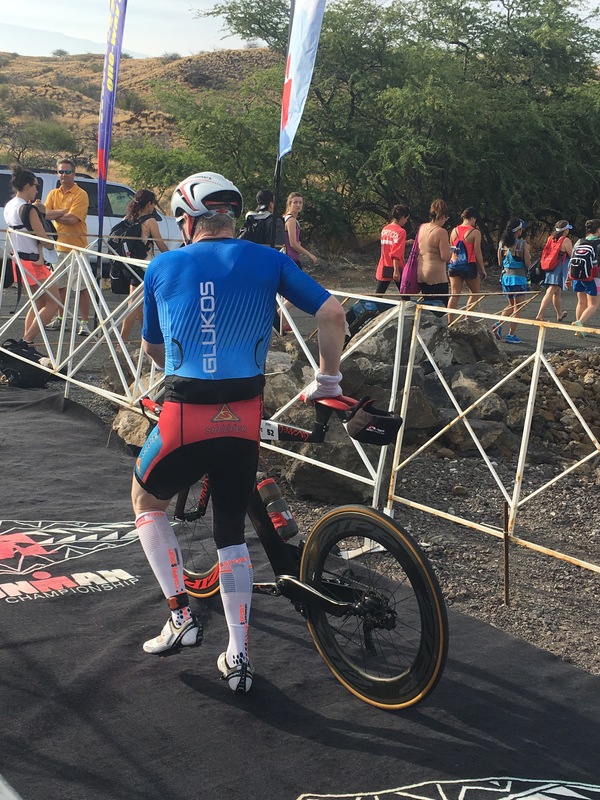 Or it might not – still not sure where I left my Ironman mojo. ← Previous Post Epic 5: If One Ironman is Good, Five in a Row is Awesome, Right? 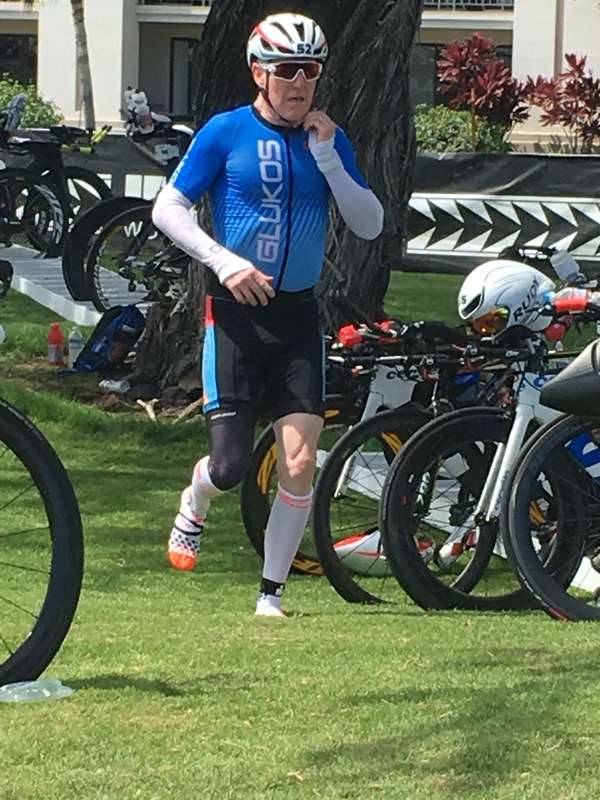 Next Post → So what happened in Ironman Santa Rosa?